이재호 작가 는 대구에서 살며 작품활동을 하고 있는 작가이다. 그의 작품은 현재 대구 미술관에서 열리고 있는 애니마믹 비엔날레의 한 섹션에서 전시하고 있다. 이 전시는 2014년 2월16일 까지 열릴 예정이다. 우리는 2번 째 이슈에 소개되었던 젤다박(Zelda Park) 작가에게 이재호 작가를 만나 “아티스트가 보는 아티스트”의 시간을 가지도록 했다. 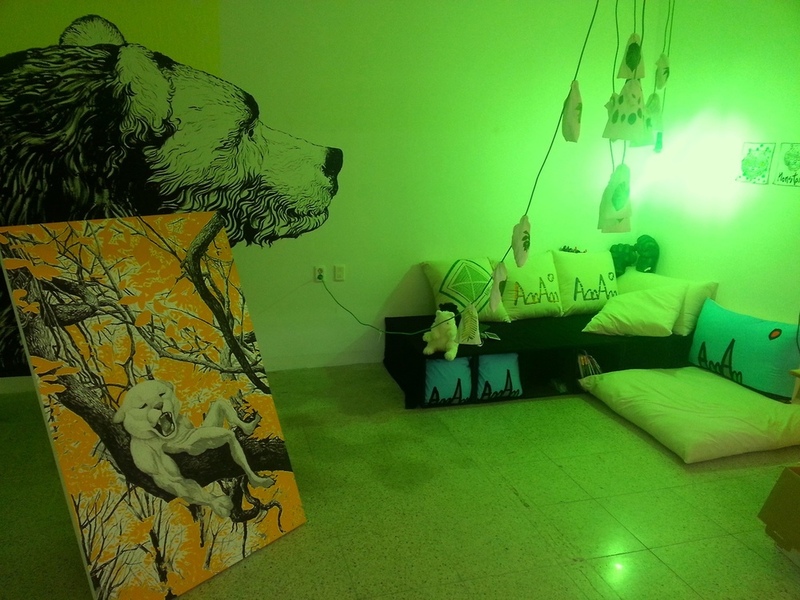 Lee Jae Ho is an artist living and working in Daegu. 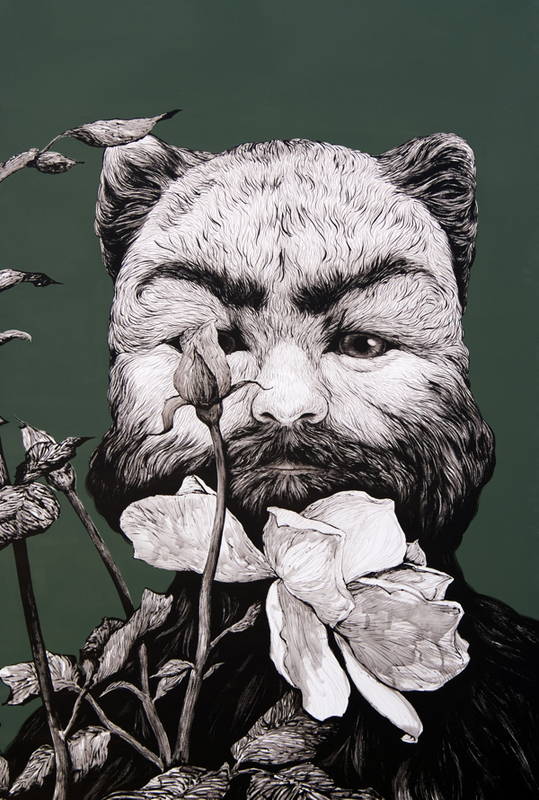 His work is currently on display at the Daegu Art Museum as part of the Animamix Biennale, which runs until the 16th of February, 2014. 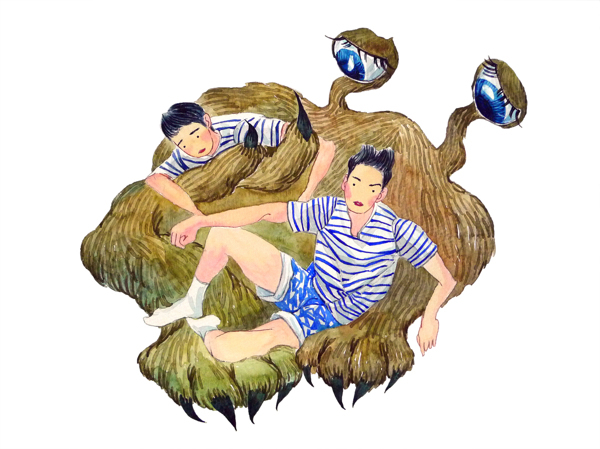 We asked our featured artist from Issue two, Zelda Park, to talk with Jaeho, artist to artist. 겨울이 오긴 왔나보다. 찬바람이 많이 부는 것이 부산도 제법 쌀쌀하다. 오늘 나는 이 매서운 바람을 뚫고 대구에서 활동중인 이재호 작가를 만나기 위해 당일치기 여행을 떠나게 되었다. 대구는 얼마나 추울까, 이재호 작가의 작품은 어떨까 등 이 것저것 많은 생각을 하며 KTX에 몸을 실었다. 낯선 곳으로의 여행, 그리고 새로운 사을 만난다는 것에 대한 약간의 긴장이 나를 덮쳤지만 이내 부산을 떠남과 동시에 그 긴장은 새로운 도시를 여행하는 것에 대한 흥분으로 바뀌었다. J: 지금 작업실이 텅텅 비었어요. 작품이 다 여기 와 있거든요. 알록달록하고 화려한 다른 작가들의 전시를 통과하고 나니 이재호 작가의 섹션이 펼쳐졌다. Z: 와 ! 사진에서 본거 보다 훨씬 크고 좋은데요? J: 처음에 벽화는 없었는데, 전시 디스플레이가 시작되고 나서 갑자기 하게 되었어요. Z: 이친구는 손이 여섯개네요! 꼬리는 뱀인가?! J: 음, 그건, 동물들을 이것저것 섞어서 만든 거에요. I realized winter had reared its head while leaving from a cold and windy Busan. I was making my way to Daegu to meet artist Jaeho Lee. At first, I was nervous about visiting Daegu and talking with another artist, but those feelings soon gave way to excitement as the KTX departed. J: My studio is completely empty; all my work is in here. We passed several vibrant and colorful pieces by other artists. We walked until we came upon Jaeho’s section. Z: Wow! It’s much bigger in person. The photo doesn’t do it justice. J: The wall wasn’t painted in the beginning. When the exhibition opened, I started to paint. Z: This one has six hands! Is that a snake on the tail? J: Well, it’s a mix of different types of animals. 이재호 작가의 거대한 숲과 몬스터 무리들을 둘러본 뒤, 우리는 차를 한 잔 하기 위해 자리를 이동했다. 때마침 탄 지하철에서 자연스럽게 지하철에서의 전시 이야기가 흘러나왔다. Z: 지하철에서도 전시를 하셨다고 들었어요. J: 네. “컬러풀 대구” 라는 행사의 한 부분으로 열차 하나를 아티스트들에게 내 주고, 그 공간에서 전시를 하도록 하는 거였어요. Z: 조금 더 자세하게 지하철 전시 이야기를 해주세요. 수 많은 열차 중에 한 개의 열차에 설치가 되었어요. 그 열차에 타려고 노력해도 쉽지가 않았어요. 그 날 타게 되는 열차가 전시 열차 였다면 완전 럭키 인거죠. 이 작업을 하면서 느낀게 좀 더 쉽게 사람들에게 접근해야 저를 알릴 수 있다고 생각했어요.예술이란 같은 감정을 공유하는 것이라고 생각해요. 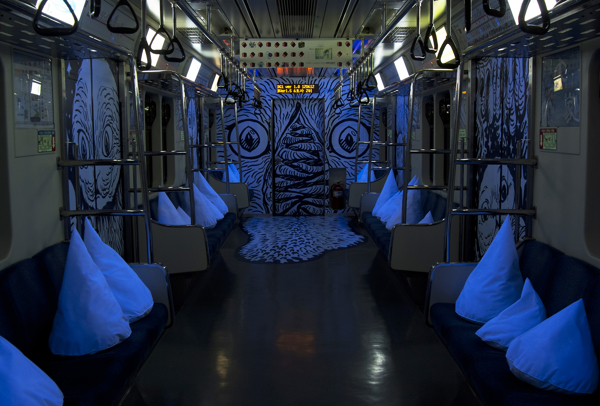 After looking around Jaeho’s monstrous painted forest and his collection of monsters, we sat down to have a cup of coffee and discussed his installation featured in a Daegu subway car. Z: You had an exhibition in a subway car, didn’t you? J: Yes, I did. It was a part of the event called Colorful Daegu. Each artist had one section of the train and we exhibited our work inside the carriage car. Z: Tell us some of the details of the subway exhibition. Only one train was running the exhibition. It was difficult to find that one particular train. It was total luck if you got on it. What I realized through this project was that I needed to approach people in softer ways to gain recognition. I think the function of art is to share feelings. Z: 저는 이재호 작가님을 Behance 를 통해 알게 되었는데요, 직접 간단한 소개를 해주세요. J: 대구에서 태어나 자라고 계명대학교를 졸업했습니다. 그리고 현재까지 이 곳에서 작업을 하고 있죠. 다른 일은 하지 않고 오로지 작품활동에만 매진하고 있어요. Z: 작업을 보면 캐릭터라고 불러야 하나요, 몬스터들이 나오는데요. 지금의 작업 느낌은 언제부터 가지게 되셨나요? J: 계명대가 아카데믹 하죠. 오일페인팅 같은 정통 그림들을 추구해요. 학창시절에 저는 그저 시키는대로만 그렸어요. 그런데 다른 수업 보니까 더 재미있는것들이 많더라구요. 현대미술이 재밌었어요. 보여주고자 하는것이 확실이있다면 재료에 있어서 오일을 쓰든 아크릴을 쓰든 조소를 하든 그런건 중요하지 않더라구요. 군대 이후 하고싶은 작업을 하기 시작했어요. Z: 그럼 군 제대 이후에 작업스타일이 바뀌게 되신건가요? J: 그런셈이죠. 개념적으로 생각하다가 이것저것 해보게 되었어요. 그림도 안 그리고 설치도 해보고 여러가지 많은 걸 시도했어요. 그러다가 나중에는 대체 내가 무얼하고 있나 하는 일종의 회의감 같은 게 들었어요. 아무리 내가 이것저것 시도를 해보아도 학교에서는 어떠한 존재감도 느낄수가 없었어요. 피드백도 없었고. 없으니까 그냥 혼자 끄적거렸어요. 그렇게 계속 끄적이다가 지금의 작업이 나온 듯 해요. Z: 이렇게 듣다보니 캐릭터에 대한 접근방식이 저랑 다르다는걸 느끼게 되는데요. 저는 디자인적 접근을 하다보니 어쩌면 처음부터 목적을 가지고 만들게 되는지도 모르겠네요. 작가님은 몬스터를 어떻게 접근하게 되었나요? J: 제 자신을 몬스터에 투영해 제 이야기를 하고 싶었어요. 이 캐릭터에 관한 연구나, 표현방법에 대한 생각보다는 어떻게 하면 몬스터를 통해 내가 말하고자 하는 바를 효과적으로 들려줄 수 있을까 생각했어요. 존재하지 않는 가상의 것이지만 나름의 이야기가 있어요, 제 자신이죠. 그림하는 사람들은 소외받는 느낌이잖아요. 제가 처한 상황이 아웃사이더의 느낌이랄까. 보편적인 저의 나이또래 친구들은 취직을 하고 있고 그런 그들과 비교해보면 제 삶은 동떨어져 있다고 생각해요. 그래서 외롭고 소외받은 몬스터, 즉 내 자신에게 어떤 이름이라도 주고 싶었어요. Z: I feel like I got to know you and your work through ‘Behance’. Can you Tell us about yourself? J: I was born and raised in Daegu and graduated from Keimyung University. I don’t have a job but I’m currently working on projects. Z: In almost all of your projects there are usually some animal like characters - the monsters! When did you start doing this kind of work? J: Keimyung University is pretty academic institution. Tutors seem to pursue classical stuff like oil painting. I just drew what my professors assigned me. However, one day I discovered there were way more interesting styles - ‘Modern Art’. It doesn’t matter if you work with oil, acryilics or sculpture as long as you have a clear idea and view toward your artwork. I started doing art that I wanted to do after I completed my military service. Z: So, your work has changed since your military service? J: Possibly. I tried a lot of stuff. I made installation art that didn’t involve drawing or painting. I had doubts about what I was doing. So, I tried a variety of styles and didn’t receive any attention at university. I felt like I was nothing. I had zero feed back from the professors so I decided to just create for myself. After experiencing this kind of process, my current style emerged. Z: Your approach to work is different from mine. I create or design with a certain intention from the very beginning. I think I approach work in this fashion because of my designer background. What’s the process of approaching your monsters? J: In some way, I wanted to project part of myself as a monster within my work. I didn’t think about the monster characters as they appear. I’d think, ‘How can I effectively show what I want to say by using the monsters.’ The environments I create don’t actually exist but they carry their own story. My story actually. Artists have a neglected existence. I often see myself as an outsider to society. I’m different from ordinary people - most of my friends have a job and are working. So, I wanted to give a name and a face to represent how my character feels, ‘A lonely and neglected monster.’ Me. Z: 저도 보편적인 제 나이또래와는 다른 삶을 살고 있어요. 그래서 여러가지로 공감이 가네요. 오늘 봤던 애니마믹 비엔날레 전시를 이야기하고 싶어요. J: 이번 전시의 배경은 숲속입니다.각기 다 다른 이미지의 집합체이지만, 전체적인 맥락은 숲속이라는 것에서 시작되요. J: 네. 몬스터가 사는 세상이에요. 이 세상은 일반세상과 달라요. 보통의 사람들이 자는 시간에 몬스터들은 활동을 시작하는 거죠. 숲속을 정한이유는 이 곳에서 무작위로 풀들이 자라나고 있는 것처럼 보이지만 사실 그 속에 질서가 있어요. 예쁜 꽃이든, 잡초든 자신의 위치에서 제 역할을 하고 있죠. 이처럼 내가 비록 사회에서 아웃사이더이라 할지라도, 내 역할을 열심히 하고 있죠. 그러면 언젠가는 외모나 조건이나 보이는 것이 아닌 자신만의 매력을 인정하는 사회가 오지 않을까 생각했습니다. 그런 희망과 바램을 가지고 숲속을 배경으로 이용했어요. 자연 생태계의 무질서함 속의 질서가 있는 모습에서 모티브를 얻은 셈이죠. Z: 그림을 그려야겠다고, 미술가로써의 진로는 어떻게 정하셨나요? J: 어렸을 적부터 꿈이 많았어요. 그런데 다 예능이었어요. 그 중에서 특히 패션디자인. 군대 이후까지 정말 하고 싶었어요.졸 업하고 유학을 갈 생각이 있었어요. 실용적인 패션이 아닌 오트쿠튀르 쪽으로. 패션뿐만 아니라 라이프 스타일을 다 아우를 수 있는 토탈패션을 하고 싶었어요. 하지만 영어공부도 열심히 했었어야 했고, 집안 사정상 힘들어서 관둬야만 했어요. Z: 저랑 비슷한 점이 많네요. 저는 불만이 많았어요. 살고 있는 도시에 대해서나, 현실적으로 금전적 문제라든가. 이런 점에서는 어떠세요, 아티스트로서의 삶을 산다는 것이 힘들 것 같은데요? J: 아직 까지는 괜찮아요. 전시가 계속 이어져서 운이 좋았던 거 같아요. 시간도 자유롭게 쓸 수 도 있고. 앞으로가 걱정이죠. 미래가 없다는 거. 자의적으로든 타의적으로든 어쩌면 현실적인 벽에 부딪혀 그림을 안 하게 될지도 모른다는 생각도 가끔해요. 그것 빼고는 괜찮아요. Z: Lets talk about the Animamix Biennale we saw today. J: This exhibition is of a forest where all the monsters have different faces. Z: Monsters in a forest! J: Yes. The world the monsters live in, is quite different from the ordinary world. They come alive when people are sleeping. I decided to paint this environment because despite all of the plants and flowers and how random they appear in a forest, there is always some form of order. Whether it’s beautiful flowers or ugly weeds, each thing plays a role. Even if I’m an outsider of society, I play a role. I once thought that if I kept playing that role then perhaps I’ll be admitted to society for who I am rather than for my appearance and achievements. The forest is a symbol of hope for me. I’m inspired by nature, which has an order for everything, though it seems random. Z: When did you decide to become an artist? J: I’ve wanted to do so many things since I was child and all them were related to art. I really wanted to be Fashion Design, even after my military service. I was going to study abroad after graduation. I wanted to do total fashion, which covers life style--not just fashion. However, I had to study English a lot and at the same time I had some financial troubles. So, I quit. Z : I understand. We have similar worries. I complain a little about where I live and some financial problems. It’s not that easy to make a living as an artist. What about you? J: So far so good. I’m fortunate to keep having exhibitions. I also have more free time as well. However, I’m worried about the future. Nothing is ever certain. I’m worried that I will give up pursuing a career as an artist because of reality. I try not to think about it. Apart from that, I think its okay to keep living like this. Z: 작업공간, 작업프로세스에 대해 듣고 싶어요. J: 작업실엔 별 거없어요. 책상 하나 이젤 하나. 큰 그림은 이젤에서 그리고 작은 그림은 책상에서 그려요. 그림을 에스키스용으로 그리고 그것을 수채화로 그리고 다시 큰 작업으로 옮기는 과정을 거쳐요. 스케치하고 스캔하고 수채화로 그리고 스캔하는 과정입니다. 처음에는 먹으로 작업했어요. 재료비가 많이 들지 않았죠. 먹의 필력이 좋아서 계속 썼어요. 먹은 빨리 작업할수 있어서 좋았어요. 성격이 급한 탓인 것 같아요. Z: 작업할 때 특별히 듣는 음악이나 필요한 환경이 있나요? J: 음악을 듣기 보다 라디오나 말이 나오는 쪽이 좋아요. 미야자키 하야오를 좋아해서 애니매이션을 늘 틀어놔요. 정말 외울 정도로 틀어 놨어요. Z: 그림에서 영향받은 것들이 느껴지네요. Z: Tell us about your studio and your creative process. J: There’s nothing special in my studio. A desk and an easel. I draw large pieces on the easel while smaller pieces are done on the desk. I draw for esquisse and then work with watercolors before I move to a big canvas. Sketching, scanning, working with watercolors and then scanning. That is my process. I used ink sticks when I first started. They don’t cost that much. I liked the feel and the brush stroke power. I could draw quickly. I think I have a short temper. I want to finish things quickly. Z: Do you listen to any music or require any special conditions when you’re working? J: I prefer listening to the radio or a conversation from the TV rather than music. I love Hayao Miyazaki, so I often have his animations on in the background. I know almost all of them by heart. Z: When I look at your paintings I can tell you were influenced by his animations. Z: 2013년의 다른 전시는 어땠나요? J: 졸업 후, 첫 전시는 학교에서 기획한 전시를 했어요. 취 업 인정을 위한 전시가 있는데 그걸 두 번 했어요. 수창동에서 전시를 한 이후 지금까지 전시가 이어졌어요. 공모에 지원해서 하게 된 전시가 유리관에 인형400개 가량을 넣어 설치한 것 이었어요. 유리관안에 인형을 가득 채우고 싶었는데. 400개로 모자라더라구요. 그래도 전 참 좋았어요. Z: 마지막으로 향후 계획에 대해 들려주세요. 미술시장을 겨냥하고 계신가요? J: 토탈미술이라고 해야할까요, 다 하고 싶어요. 패브릭 쪽으로도 관심이 많아요. 혹시 개인전을 열게되면 몬스터가 사는 세상을 구축하고 싶어요. 몬스터가 지내는 침대나 옷들이나 그런 것까지 다요. 그런 전시를 통해 한 명씩 자연스럽게 저를 알아가게끔 하고 싶어요. 그리고 미래에 대한 준비는 없지만 레지던시 나 공모를 찾고 있어요. 어떤 형태로든 작품활동은 계속 이어나가야 하니까요. Z: 나중에 전시하시면 꼭 불러주세요. Z: How were your other exhibitions in 2013? J: The first exhibition, after graduation, was organized by my school. I had two exhibitions for school. I had an exhibition at Suchangdong. I applied to a contest and got a chance to exhibit an installation piece where I filled a glass room with 400 dolls. I wanted to fill it all the way but 400 dolls weren’t enough; but I liked it. Z: What are your future plans? J: Well, I’d like to do everything. I’d call this “Total Art.” I’m pretty interested in fabric so if I have a personal exhibition, I’d like to construct a monster’s world where I make beds and clothes, stuff like that. Through this personal exhibition, I’d showcase myself. Though, I feel that I’m not ready, I’m currently looking for residencies and some contests. It doesn’t really matter what they are, I just need to continue to produce my personal work. Z: Let me know when you have your personal exhibition!